Excellent week of boating in the Alps! I think there was quite a lot of snow on the mountains still, which made for unusually high water for this time of year (as the sun melts it all off). In fact we were arriving just a few days after a too-much-water kayaking ban had been lifted, and the rivers were indeed a little more bouncy and pushy than my memories of the same runs on previous trips. This turned out to be a good thing. Plenty of challenges forcing rolls here and there, but I got into the zone pretty well. No swims, and I came away with a good feeling of paddling achievement. Our day on the Guile was perhaps the only exception. My nerves were on edge for some reason. Triple-step was looking too fearsome for me, although I would have loved to conquer this after fluffing it back in 2005. And when we got to the “slandslide” section (A.K.A. “staircase”) I bottled it and portaged. However there was some vindication when Ralph, despite being in the hugest creekboat known to man, got an absolute munching in the stopper at “letterbox”. He took a swim and was left looking a bit shaken. Apparently the hole almost stripped his shorts off him! As I said before, we were staying in a posh chalet, but we’d met up with Ralph some of the other guys, who were slumming it on the campsite in the valley bottom, and we took pity on them on a couple of evenings when it was chucking down with rain. Everyone came round to the chalet, which along with James and his two mates, made for quite a gathering. After the first three days of cloud/rain downpours, the sun came out. These are the conditions which make French Alps so enjoyable. Baking hot sunshine and blue/green glacier water to jump in and cool down. This picture is a nice tributary of the Ubaye which was particularly beautiful. It’s funny how stressful things always seems to accumulate during the period in the run up to a holiday. This week’s been a bit frantic. I’ve ended up with a lot of work to finish off today, and now my PortalBuilder server has come up with a new and unexpected error message to thwart me. Looks like I’ll have to give up on that. I’ll be leaving a semi-half-finished-non-operational mess behind. That’s shame, but what the hell…. 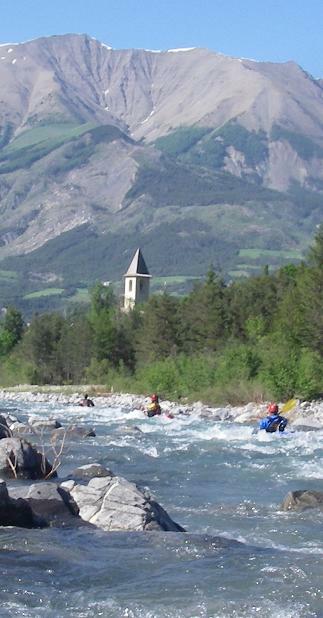 I’m going whitewater kayaking in the Alps for a week! That’s right, I’m off kayaking, for the first time since January. I feel a bit out of practice. I’m also feeling a little bit apprehensive because I will be the only one of the group in a silly little playboat. Everyone else will be in more heavyweight creek boats. I have visions of being left behind looping in a stopper while everyone else punches on through. The plan started out as just a small group, with at least half of us being of a “laze around in the sunshine, take it easy on the rivers, and have a relaxing holiday” persuasion. But the group has since expanded to seven people (I think), most of whom will be persuading me to stop being a wuss and take on some adrenaline challenges. Right now that feels like the last thing I need. I will be spending a fair proportion of next week chilling in the Alpine sunshine with a plastic bidon of cheap french wine. Oh yes. Because this is an oldies canoe club trip, not the usual imperial college uni group, we won’t be doing the usual cheapo slumming on a campsite. No no. We have a chalet booked. Very posh. I ordered myself a new camera. I had to, because last weekend my nice little Casio Exilim became very broken (dropped!) I decided it would be too unimaginative to order another ordinary compact camera, so I pondered SLRs (But they’re too big for carrying everywhere, and I like to carry my camera everywhere), and I pondered a camera-phone (but I don’t want a contract, so they’re quite expensive. Second-hand on ebay could be a good option, but I need to spend more time researching). Instead I’ve gone for a waterproof camera. Fairly ordinary compact, and not as beautiful as the Exilim, but great for kayaking! At least I hope it is waterproof. Some of the user reviews are saying that it broke as soon as they tried it underwater. I haven’t taken delivery of the camera yet. Picking it up a few hours before I set off on holiday this evening. So this is another thing I’m stressing about this week. Green Hat has bought Solstice Software, a U.S. based testing software company. “Solstice has always been an innovative company, and this acquisition will not only extend Green Hat’s technology but also provide North American sales, development and product support, something our existing North American customers have requested. We are delighted to welcome the staff of Solstice to the Green Hat family,” said Peter Cole, Green Hat’s Founder. While I’m out consulting on site, this isn’t effecting me much, but it sounds like there’s a lot of activity back in the office, working on integrating Solstice and Green Hat. Lots of work on integrating our software offerings too. But hey… it should be easy. Integration is what we do. …well we’ll see. Anyway expansion is always fun. We’ll probably bring that whole team onto the wiki (Green Hat’s internal knowledge-bank) so I wonder if we’ll see some good transatlantic wiki knowledge sharing in the coming months. We can’t easily meet face-to-face, and there’s only so much knowledge sharing that can be achieved over email/skype, so this kind of thing is where wikis can really excel. We already find it quite helpful on occasions for sharing/coordinating with our people in Belfast and Australia… and Ealing. But I’m hoping that there will be a wiki enthusiast or two among the new joiners.